The bottom waveform is missing the fundamental frequency, 100 hertz, and the second harmonic, 200 hertz. The periodicity is nevertheless clear when compared to the full-spectrum waveform on top. A harmonic sound is said to have a missing fundamental, suppressed fundamental, or phantom fundamental when its overtones suggest a fundamental frequency but the sound lacks a component at the fundamental frequency itself. The brain perceives the pitch of a tone not only by its fundamental frequency, but also by the periodicity implied by the relationship between the higher harmonics; we may perceive the same pitch (perhaps with a different timbre) even if the fundamental frequency is missing from a tone. For example, when a note (that is not a pure tone) has a pitch of 100 Hz, it will consist of frequency components that are integer multiples of that value (e.g. 100, 200, 300, 400, 500.... Hz). However, smaller loudspeakers may not produce low frequencies, and so in our example, the 100 Hz component may be missing. Nevertheless, a pitch corresponding to the fundamental may still be heard. The GCD of the frequency of all harmonics is the fundamental (dashed). A low pitch (also known as the pitch of the missing fundamental or virtual pitch) can sometimes be heard when there is no apparent source or component of that frequency. This perception is due to the brain interpreting repetition patterns that are present. It was once thought that this effect was because the missing fundamental was replaced by distortions introduced by the physics of the ear. However, experiments subsequently showed that when a noise was added that would have masked these distortions had they been present, listeners still heard a pitch corresponding to the missing fundamental, as reported by J. C. R. Licklider in 1954. It is now widely accepted that the brain processes the information present in the overtones to calculate the fundamental frequency. The precise way in which it does so is still a matter of debate, but the processing seems to be based on an autocorrelation involving the timing of neural impulses in the auditory nerve. However, it has long been noted that any neural mechanisms which may accomplish a delay (a necessary operation of a true autocorrelation) have not been found. At least one model shows a temporal delay to be unnecessary to produce an autocorrelation model of pitch perception, appealing to phase shifts between cochlear filters; however, earlier work has shown that certain sounds with a prominent peak in their autocorrelation function do not elicit a corresponding pitch percept, and that certain sounds without a peak in their autocorrelation function nevertheless elicit a pitch. Autocorrelation can thus be considered, at best, an incomplete model. The pitch of the missing fundamental, usually at the greatest common divisor of the frequencies present, is not, however, always perceived. Research conducted at Heidelberg University shows that, under narrow stimulus conditions with a small number of harmonics, the general population can be divided into those who perceive missing fundamentals, and those who primarily hear the overtones instead. This was done by asking subjects to judge the direction of motion (up or down) of two complexes in succession. The authors used structural MRI and MEG to show that the preference for missing fundamental hearing correlated with left-hemisphere lateralization of pitch perception, where the preference for spectral hearing correlated with right-hemisphere lateralization, and those who exhibited the latter preference tended to be musicians. On-line sound examples comparing pure and complex tones and complexes with missing fundamentals can be found here. Timpani (kettle drums) produce inharmonic overtones, but are constructed and tuned to produce near-harmonic overtones to an implied missing fundamental. Hit in the usual way (half to three-quarters the distance from the center to the rim), the fundamental note of a timpani is very weak in relation to its second through fifth "harmonic" overtones. A timpani might be tuned to produce sound most strongly at 200, 302, 398, and 488 Hz, for instance, implying a missing fundamental at 100 Hz (though the actual dampened fundamental is 170 Hz). A violin's lowest air and body resonances generally fall between 250 Hz and 300 Hz. The fundamental frequency of the open G3 string is below 200 Hz in modern tunings as well as most historical tunings, so the lowest notes of a violin have an attenuated fundamental, although listeners seldom notice this. The fundamental frequency is not normally heard on acoustic guitars, classical guitars and other stringed instruments with one end of the strings anchored on a soundboard bridge which has a low profile, holding the strings close to the soundboard surface. In these cases, the lateral string vibration has no discernable effect on the bridge; instead, the bridge is excited by changes in string tension, which are twice the lateral wave frequency. On these instruments, listeners hear the first harmonic as the lowest note. Electric guitars are not like this; the fundamental frequency of each string is heard because the lateral string movement excites the electric pickups underneath the vibrating string. Most common telephones cannot reproduce sounds lower than 300 Hz, but a male voice has a fundamental frequency of approximately 150 Hz. Because of the missing fundamental effect, the fundamental frequencies of male voices are still perceived as their pitches over the telephone. The missing fundamental phenomenon is used electronically by some pro audio manufacturers to allow sound systems to seem to produce notes that are lower in pitch than they are capable of reproducing. In a hardware effects unit or a software plugin, a crossover filter is set at a low frequency above which the sound system is capable of safely reproducing tones. Musical signal content above the high-pass part of the crossover filter is sent to the main output which is amplified by the sound system. Low frequency content below the low-pass part of the crossover filter is sent to a circuit where harmonics are synthesized above the low notes. The newly created harmonics are mixed back into the main output to create a perception of the filtered-out low notes. Using a device with this synthetic process can reduce complaints from low frequency noise carrying through walls and it can be employed to reduce low frequency content in loud music that might otherwise vibrate and damage breakable valuables. Some pipe organs makes use of this phenomenon as a resultant tone, which allows relatively smaller bass pipes to produce very low-pitched sounds. This very concept of "missing fundamental" being reproduced based on the overtones in the tone has been used to create the illusion of bass in sound systems that are not capable of such bass. In mid-1999, Meir Shashoua of Tel Aviv, co-founder of Waves Audio, patented an algorithm to create the sense of the missing fundamental by synthesizing higher harmonics. Waves Audio released the MaxxBass plug-in to allow computer users to apply the synthesized harmonics to their audio files. Later, Waves Audio produced small subwoofers that relied on the missing fundamental concept to give the illusion of low bass. Both products processed certain overtones selectively to help small loudspeakers, ones which could not reproduce low-frequency components, to sound as if they were capable of low bass. Both products included a high-pass filter which greatly attenuated all the low frequency tones that were expected to be beyond the capabilities of the target sound system. One example of a popular song that was recorded with MaxxBass processing is "Lady Marmalade", the 2001 Grammy award-winning version sung by Christina Aguilera, Lil' Kim, Mýa, and Pink, produced by Missy Elliott. Other software and hardware companies have developed their own versions of missing fundamental-based bass augmentation products. The poor bass reproduction of earbuds has been identified as a possible target for such processing. Many computer sound systems are not capable of low bass, and songs offered to consumers via computer have been identified as ones that may benefit from augmented bass harmonics processing. ^ Jan Schnupp, Israel Nelken and Andrew King (2011). Auditory Neuroscience. MIT Press. ISBN 978-0-262-11318-2. Archived from the original on 2012-03-18. Retrieved 2018-08-30. ^ John Clark, Colin Yallop and Janet Fletcher (2007). An Introduction to Phonetics and Phonology. Blackwell Publishing. ISBN 978-1-4051-3083-7. ^ a b Christopher J. Plack (2005). Pitch: Neural Coding and Perception. Springer. ISBN 978-0-387-23472-4. ^ Peter M. Todd and D. Gareth Loy (1991). Music and Connectionism. MIT Press. ISBN 978-0-262-20081-3. ^ Cariani, P.A. ; Delgutte, B. (September 1996). "Neural Correlates of the Pitch of Complex Tones. I. Pitch and Pitch Salience" (PDF). Journal of Neurophysiology. 76 (3): 1698–1716. doi:10.1152/jn.1996.76.3.1698. PMID 8890286. Retrieved 13 November 2012. ^ de Cheveigné, A.; Pressnitzer, D. (June 2006). "The case of the missing delay lines: Synthetic delays obtained by cross-channel phase interaction" (PDF). Journal of the Acoustical Society of America. 119 (6): 3908–3918. Bibcode:2006ASAJ..119.3908D. doi:10.1121/1.2195291. PMID 16838534. Retrieved 13 November 2012. ^ Kaernbach, C.; Demany, L. (October 1998). "Psychophysical evidence against the autocorrelation theory of auditory temporal processing". Journal of the Acoustical Society of America. 104 (4): 2298–2306. Bibcode:1998ASAJ..104.2298K. doi:10.1121/1.423742. PMID 10491694. ^ Pressnitzer, D.; de Cheveigné, A.; Winter, I.M. (January 2002). 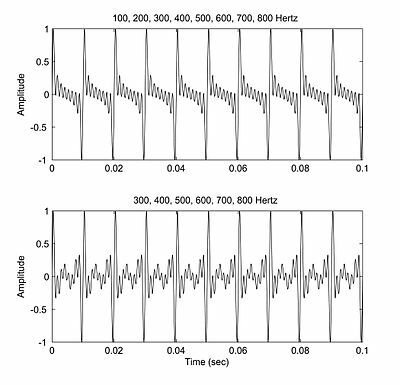 "Perceptual pitch shift for sounds with similar waveform autocorrelation". Acoustics Research Letters Online. 3 (1): 1–6. doi:10.1121/1.1416671. ^ Burns, E.M.; Viemeister, N.F. (October 1976). "Nonspectral pitch". Journal of the Acoustical Society of America. 60 (4): 863–869. Bibcode:1976ASAJ...60..863B. doi:10.1121/1.381166. ^ Fitzgerald, M.B. ; Wright, B. (December 2005). "A perceptual learning investigation of the pitch elicited by amplitude-modulated noise". Journal of the Acoustical Society of America. 118 (6): 3794–3803. Bibcode:2005ASAJ..118.3794F. doi:10.1121/1.2074687. PMID 16419824. ^ Schwartz, D.A. ; Purves, D. (May 2004). "Pitch is determined by naturally occurring periodic sounds" (PDF). Hearing Research. 194 (1–2): 31–46. doi:10.1016/j.heares.2004.01.019. PMID 15276674. Archived from the original (PDF) on 2012-12-08. Retrieved 4 September 2012. ^ Schneider, P.; Sluming, V.; Roberts, N.; Scherg, M.; Goebel, R.; Specht, H.; Dosch, H.G. ; Bleeck, S.; Stippich, C.; Rupp, A. (August 2005). "Structural and functional asymmetry of lateral Heschl's gyrus reflects pitch perception preference" (PDF). Nature Neuroscience. 8 (9): 1241–1247. doi:10.1038/nn1530. PMID 16116442. ^ a b Howard, David M.; Jamie Angus (2006). Acoustics and Psychoacoustics. Focal Press. pp. 200–3. ISBN 978-0-240-51995-1. ^ McGill University. Physics Department. Guy D. Moore. Lecture 26: Percussion. "The sequence 1; 1:51; 1:99; 2:44; 2:89 is almost 1; 1:5; 2; 2:5; 3 which is the harmonic series of a missing fundamental." ^ Decker, Jr, John A (22 February 2007). "Guitar acoustics 101-from a talk to the Seattle University Physics Club". Guitar master works. Retrieved 21 September 2015. ^ Mather, George (2006). Foundations of perception. Taylor & Francis. p. 125. ISBN 978-0-86377-835-3. Retrieved May 11, 2010. ^ "ProSoundWeb. LAB: The Classic Live Audio Board. Re: maxxbass posts by Doug Fowler June 28-29, 2008". Archived from the original on 2011-05-21. Retrieved 2008-09-03. ^ Norem, Josh (May 2004). "MaxxBass MiniWoofer". Maximum PC: 78. ISSN 1522-4279. Retrieved May 11, 2010. ^ a b Bundschuh, Paul (April 15–17, 2004). "MaxxBass Applications for Small, Full Range Loudspeakers" (PDF). Loudspeaker University. Nashua, New Hampshire: Waves Audio. Retrieved May 11, 2010. ^ Arora, Manish; Seongcheol Jang; Hangil Moon (September 2006). "Low Complexity Virtual Bass Enhancement Algorithm For Portable Multimedia Device". AES Conference. Retrieved May 11, 2010. ^ Houghton, Matt (April 2007). "Better Bass: The Complete Guide To Recording, Mixing & Monitoring The Low End". Sound on Sound. Retrieved May 11, 2010.